Some portions of the Arctic are so remote and barren, they seem like another planet. In fact, until recently, there were more detailed maps of Mars and the moon than certain parts of the Arctic. But with climate change occurring more rapidly in the Arctic than anywhere on Earth, there has been an increasing need for high-quality maps that can track geographic changes in the region, said Ian Howat, professor of Earth sciences, director of the Byrd Polar and Climate Research Center (BPCRC) and a principal investigator on the ArcticDEM project, which has created the first high-resolution digital elevation maps (DEMs) of the Arctic. The public-private initiative — formed in 2015 following former President Barack Obama’s Executive Order that included enhancing environmental stewardship in the Arctic — has brought the polar region “from the worst- to the best-mapped terrain on Earth,” Howat said. ArcticDEM maps can be viewed in various settings. 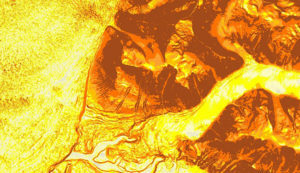 This visualization illustrates how steep the terrain is, with steeper slopes in darker colors (orange and brown) and flatter slopes in lighter colors (yellow and gray). The maps are made using sub-meter resolution satellite imagery and supercomputing software developed by Howat and Myoung-Jong Noh, senior research associate at BPCRC. The result is extremely accurate maps that in some places show surface elevation differences of less than 2 feet. Before ArcticDEM, some parts of the Arctic hadn’t been mapped in nearly a century, if at all, said Salvatore Candela, a graduate student at the School of Earth Sciences who is using ArcticDEM data to measure glacier thinning in Greenland. He is currently comparing ArcticDEM data with past datasets from the U.S. Geological Survey’s Landsat satellite to analyze changes in 205 glaciers across Greenland.